In Photo soldier who squeezed my chin said: "Girl, you saved yourself today I have my uniform on." 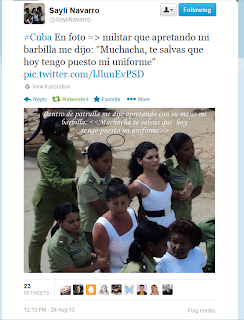 Today over twitter Henry Constantin revealed that "Sayli Navarro was expelled from her university in Matanzas, Cuba for her political attitude." He then went on to ask, "if you know of similar cases, tell me. We have to do something." Two years ago I was expelled from the university. I was completing the third year of a degree in Law in one of the university campuses that the Ministry of Higher Education enabled in the municipalities when I was expelled for passing a training course in journalism in the United States Interests Section, sponsored by Florida International University. However, the question Constantin raised about other cases was surprising. There is a long history of Cuban youths being denied entry to university or into particular disciplines for their parents religious or political beliefs alone. It is systematically considered in a student's academic record along with their own political attitudes. Henry Constantin was himself expelled from university for being an independent blogger in 2011. In 2010 Marta Bravo Pérez was expelled from the Universidad Central de Las Villas for resigning from the Union of Young Communists and Darío Alejandro Paulino Escobar was expelled for trying to create a facebook account from the University of Havana. Although, I don't live in Cuba I know of students who were expelled for signing the Varela Project. Harold Cepero who was killed on July 22, 2012 had been removed from university on November 3, 2002 and subjected to an act of repudiation for supporting the petition initiative. He wrote an open letter in protest that has been translated to English. In a casual conversation with rapper Raudel Collazo he mentioned in passing that he had been expelled from the university shortly after he had signed the Varela Project. University officials invented an excuse to get rid of him and did so. Later on he began to run into other expelled students and their commonality was that all of them had signed the Varela Project. There are generations of Cubans denied higher education because they did not pass the regime's ideological litmus test. Unfortunately, the subordination of education in Cuba to ideological indoctrination is not something new but an old feature of a bankrupt dictatorship. Inside the patrol car she squeezed my chin and said: "Girl, you saved yourself today I have my uniform on." She is a courageous young woman who is speaking truth to power while maintaining nonviolent discipline within the Ladies in White movement struggling to see that human rights are respected in Cuba. Access to education should not be determined by a political or ideological litmus test as it is today in Cuba. In a real sense because of this there is no right to education but a privilege to be granted to those who demonstrate their unquestioning loyalty to the regime. Capitol Hill Cubans is encouraging the circulation of the hashtag #StandWithSayli and its a great idea to highlight the courage of this young woman with a demonstration of solidarity.